The Auction World sale is being held April 20-22. Auction World Co. Ltd., in association with World Coins Japan, is presenting its 16th Auction, featuring coins and other rare items from all over the world. The top lot in the auction is a complete 1839 Great Britain Proof Set, which is entirely certified by NGC. The amazing set includes 15 gold, silver and copper coins, representing each denomination and type issued in 1839. Among these is an NGC PF 64 Cameo example of the most famous of all British coins: the "Una and the Lion" Gold Five Sovereign. 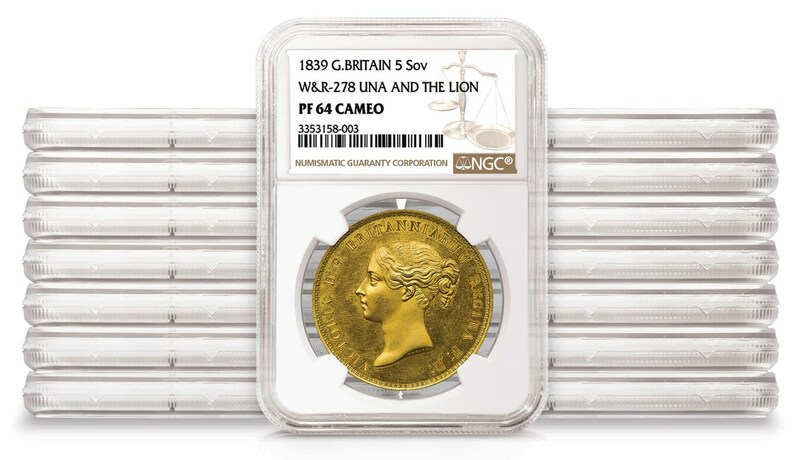 This 1839 Great Britain "Una and the Lion" Gold Five Sovereign, graded NGC PF 64 Cameo, is the centerpiece of a 15-coin Proof Set. All estimates provided by the auction house.